American evangelicalism has been on a downward slide since the 1960s. It has progressively succumbed to the humanistic spirit of the world and as a result has made the narrow gate wide. Now, large segments of the American evangelical church no longer identify with the truth, passion, power, and other hallmarks of New Testament Christianity. The spirit of the world has captured the hearts and agenda of many evangelical churches. Accommodation and compromise are key elements used to sanitize and smooth the rough edges of an old-fashioned gospel flowing from a rugged, blood-stained cross that requires death to self. Thereafter, the enlightened church is freed to focus its efforts on the temporal needs of the saint and sinner alike. The new church is consumer-oriented for its patrons are clients to be pampered. The gospel is softened so as not to offend. Therapy replaces salvation in dealing with sin. Worship becomes entertainment. Commitment becomes optional as church attendance for many is limited to an hour or two on Sunday mornings once or twice a month. The gospel of self-improvement is preached instead of sanctification through the work of the Holy Spirit and power of the uncorrupted Word of God. Pragmatism determines truth for whatever works must be true. Scientifically designed methods have replaced the Holy Spirit and are used to entice the seeker-shopper to come and enjoy a user-friendly program so that they can determine if Christianity is right for them. 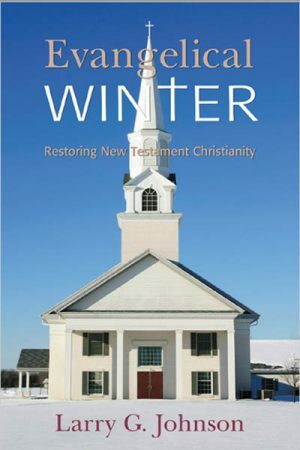 In this new church man’s efforts have replaced the inerrant Word of God as its guiding light, but such has brought the chill of a wintry season which has settled over much of evangelicalism in America. Correction must be preceded by a truthful diagnosis of the church’s spiritual sickness. Accurately diagnosed, the church must make necessary course corrections in the light of the unalterable pattern of New Testament Christianity. That is the purpose of this book. Available from Amazon.com and other book marketers. Also, available in various eBook formats including Amazon’s Kindle.